A Card to Wallet effect that you have never seen before! An empty pass case is shown on both sides and is placed down in front of the spectator. The chosen card is then signed and placed back into the deck. With a snap of the fingers and without any suspicious moves, the pass case is turned over. The empty pass case suddenly has one card inside of it. The magician removes the card from the case, indicating that it is their card. When turned over, it is revealed to be the spectator's signed card! The pass case can be shown on both sides before and after the performance. No forces are necessary. The spectator has a free choice. Only one signed card is used. The pass case can be used in your daily life. Everything can be completely examined at the end of the performance. Blue / Red Bicycle Rider Back decks can be used. The pass case can be used in your daily life, and is made of genuine leather, giving it a luxurious appearance. 2 years of development has been put into this Wonder Pass Case. This will be your new 'go to' Card to Wallet trick! 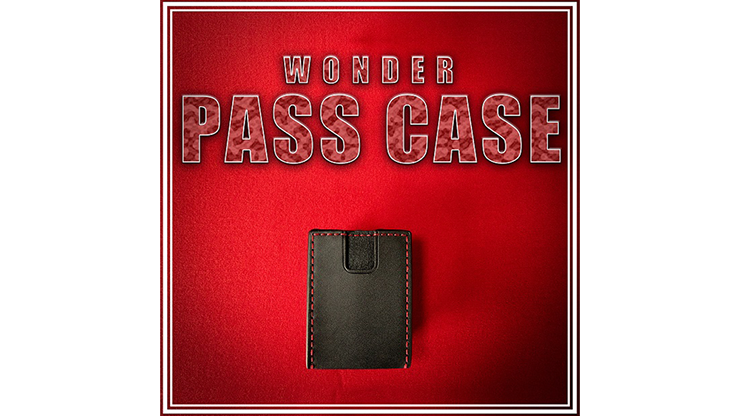 This is Wonder Pass Case. You will need to supply your own regular Bicycle Rider Back Deck.